After seeing this recipe from Trader Joe's Recipes, I knew I just had to make them! I don't go to Taco Bell often (likely a good thing! ), but I did order this Mexican pizza just to compare. I'm not really sure why - usually I just get disappointed with my order. But then, how's a restaurant, and fast food at that, to compare with homemade? 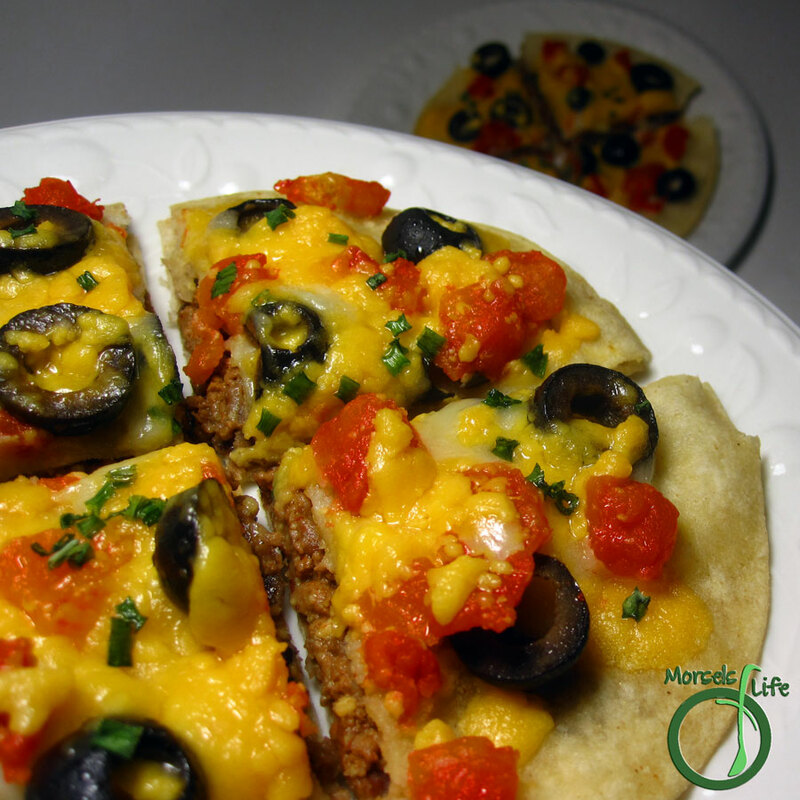 Not only were these "Mexican" pizzas tasty, they were fairly easy to make too. You just spread some refried beans and taco meat on one tortilla, and some cheese and taco toppings on the other. Stack the two tortillas, and you're ready to satisfy your craving! What's your favorite fast food DIY? Place tortillas on a baking tray. Top half the tortillas with cheese, olives, tomatoes, etc. Bake at 350F for ~10 minutes, until tortillas crisp and cheese melts. Spread refried beans over tortillas without cheese and toppings. Top refried beans with taco meat. Stack tortilla with toppings and cheese on top of tortilla with refried beans and meat. Sprinkle green onions (and any other desired toppings) on top. We love any type of pizza-and your Mexican pizza looks so good! Thanks for sharing at Must Try Monday. Mexican Pizza is a big hit around here! I am going to have to try your recipe! Thanks for sharing at Show Me Your Plaid Monday's! We definitely enjoyed it and hope you do too! I stopped by earlier today and linked up with some Guacamole. :) Might go well with this pizza too. Looks as good as the taco salad I had for lunch. Thanks for sharing with us at Throwback Thursday. Pinned! I need this one in my file! Thanks for sharing at #WonderfulWednesday. Have a great week! I love Mexican food - I've never thought to make these, though - it sounds great! Mexican Pizza, it makes so much sense and looks so good. Why have I never thought about this?! Thanks for sharing at the #WasteLessWednesday Blog Hop! I can't wait to see what you share next week. Looks really delicious! Thanks for sharing on the What's for Dinner Link up. I used to love Taco Bell Mexican pizza! This looks a billion times better!